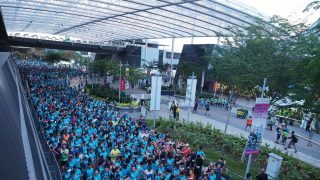 On 16 July 2016, more than 4,000 runners thronged The Promontory @ Marina Bay for the second edition of the Mizuno Ekiden in Singapore. 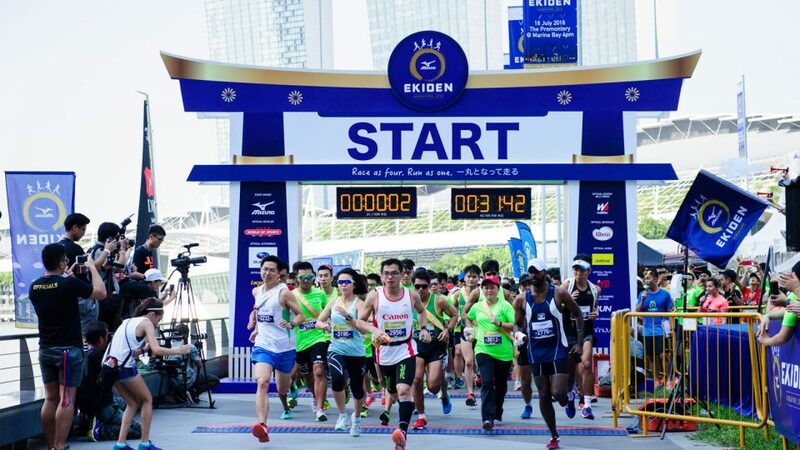 Since the inception of the Mizuno Ekiden last year, the fully-fledged Ekiden race is the first ever in Singapore to be held in the evening with the flagging off for the 42.195km category at 4 p.m and 4.30 p.m for the 21.1km category. Before the start of the race, participants were boosted by the beats of Taiko drums of the Japanese-themed carnival. 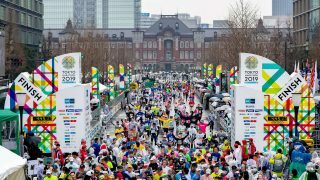 The festivities and celebrations continued at the Matsuri Race Village as participants indulged in a variety range of Japanese food and beverage options after completing their leg of the race. 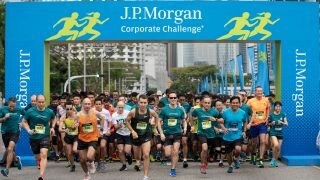 This year, the Mizuno Ekiden is also part of a year-long SJ50 celebration in commemoration of 50 years of diplomatic ties and relationship between Singapore and Japan. The event was graced by The Ambassador for the Embassy of Japan in Singapore, His Excellency Mr Kenji Shinoda, as he flagged off all race categories in the afternoon. 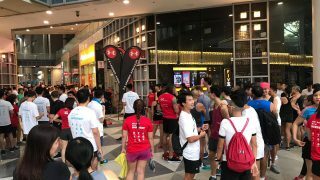 “As we celebrate SJ50 this year, an event like Mizuno Ekiden helps to bring and promote the unique Japanese culture in Singapore and it is encouraging to see many people enjoying themselves and at the same time, experiencing a sporting event that promotes strong Japanese values, the Ekiden itself." This year's winners of the 21.1km Corporate Category goes to Mr Cleeve Mu, Mr Ramesh Palaniandy, Mr Yew Meng Tan and Mr Yong Heng Cher representing the Singapore Prison Service as they successfully defended their first place win from last year’s race with a timing of 01:25:37. “Compared to last year, the competition this year was much tougher and we were not in the top positions in the first half of the race. Thankfully, our third runner managed to close the gap during his leg of the race. Eventually, we are so happy to emerge as this year’s champions and defend our title,” exclaimed team member, 41-year-old Ramesh. In other categories, the quartet of Mr Bjay Sunuwar, Mr Jite Gaha, Mr Nims Gurung and Mr Robert Rai from GC Team won the 42.195km Open Category with a timing of 2:40:26 and the team made up of Mr Chew Jee Keng, Mr Desmond Ang, Mr Evan Chee and Mr Marcus Ang from Team Rabak Rangerz won the 21.1km Open Category with a timing of 1:16:46. A new element for this year’s race was the Subaru Endurance Challenge where three of the fastest runners to complete a marked-out route of 2.4km were given a direct pass to the Subaru Challenge 2016. 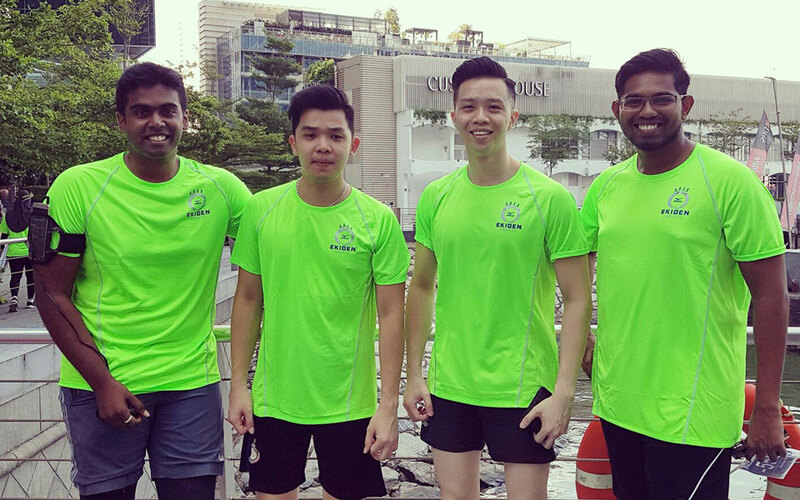 Joining the Ekiden race for the first time were our friends from Team Startup Spaze, Mr Mohamed Abbas, Mr Prakash Raja, Mr Lucius Andi Putra Asikin and Mr Gerald Tan. Team leader, Mr Gerald Tan described the experience as a great and healthy way to spend time with friends on a Saturday evening. Team Startup Spaze from L-R: Mr Mohamed Abbas, Mr Lucius Andi Putra Asikin, Mr Gerald Tan and Mr Prakash Raja. "We enjoyed ourselves at the event, besides getting occupied with the interesting Japanese-themed activities such as sumo wrestling, we were spoilt by the great variety of Japanese food and beverages at the Matsuri Race Village," explained Gerald. 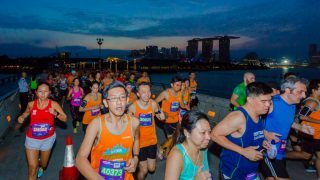 The Mizuno Ekiden brings Ekiden culture to Singapore, which focuses on Japanese values such as perseverance, teamwork and high performance. 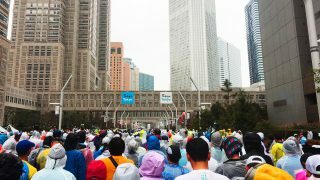 Featuring a team of four runners, each transitional point brings runners and the community together in discovering, and reigniting the Japanese culture and spirit along the race route. As the race concluded, we can't help looking forward to the third edition of the Mizuno Ekiden in 2017.